I have no idea what secretary training is, but it's irrelevant. The kind of training that gets you a certificate about your typing skills. A certified typist. I have to measure this some day. I might narrowly qualify to your definition of experienced typist. I always suspected not. Is the speed measured backspacing excluded? I.e. the characters that one must delete due to mistyping are not counted as typed, right? Now, whatever I said about unschooled typing, I didn't mean two-finger typists. I didn't mean someone who has to hunt for each key with the eyes, like for Rosinen im Striezel. Certainly all fingers would be involved, just that middle fingers would get much more work than prescribed. I have to pay more attention to how I normally type, but I am not aware of having assigned specific territories to fingers on the keyboard. It seems to me I can hit any key with any finger - currently convenient finger in the course of the sequence, that is. Middle fingers do most of the work and little fingers least, but none is idle. As long as you meet the requirements for speed and accuracy your methods don't matter. In any event, I suppose I have one of those from about twenty years ago. Traditionally mistakes are penalized. I forget by how much for the certificate mentioned above, but indeed in our modern world they can simply be ignored as irrelevant besides the extra time involved. In the event that I do make a typo, I also tend to correct it before I even become aware of it. Having your middle fingers do most of the work doesn't sound natural to me. You'll notice that people who type with two or four fingers do most of their typing by index finger. Perhaps your middle fingers are unnaturally dexterous? And I maintain that the certificate matters. It's both a mark and the result of the formal training. People without training are not likely to take the certificate test. In the event that I do make a typo, I also tend to correct it before I even become aware of it. This is an indication of a highly skilled typist. I am acutely aware of each typo and I sometimes have to rest my nerves, because correcting my own typos is a significant extra workload. Two-finger typists are inexperienced by definition. They have no say or bearing on the natural way to type. Surely you noticed how old people handle mobile phones. They hold it in one hand and press it with the index finger of the other hand. Is it more natural than youth who can hold the phone in palm and do everything with the thumb of the same hand? And now with the advent of bigger smartphones the manner of grip is changing again. Given a reasonably fast typist, the natural way to type is to give labour to all fingers, I think. I'd make the amount of typing fingers a mark of experience and skill. But there are two distinct ways to cover the keyboard. One is the standard prescribed way, to assign territories on the keyboard for each finger. The other is patterns of convenience where every next key is pressed with a different finger. One is the standard prescribed way, to assign territories on the keyboard for each finger. The other is patterns of convenience where every next key is pressed with a different finger. The reason you use the natural (ahem, "prescribed" ) way is because otherwise you have no idea where your fingers are. That is, it's the F and J keys from which everything logically derives. On a proper keyboard like mine you could of course stick marked keys wherever you like -- or nowhere at all. Provided you stick to a fairly standard QWERTY layout, I see no logical positions for the marked keys other than D and K (for middle fingers) or F and J (for index fingers). Alternatively you might try D and L or F and K, thus reducing the right-hand overload (a major design issue), but I believe that would best be accompanied by a remap. Given a standard QWERTY layout I see no reason to prefer non-standard placement. At first glance I'm tempted, but the price is steep. If I were in America, I'd definitely try to take a look at one of the events they'll have this month. I have been a certified typist for about 30 years. At that time, the finger mapping for the numeric keys row was shifted to the right. I should use the middle finger for 4 and for 9. That's the way I usually type. But I agree with ersi, we have a trend to build our own shortcuts. For instance, I wouldn't type LOLOLOLOL with just one finger. I think our brain works in a similar way as finding routes in Google Maps. Always instantly, it builds an algorithm to find the quickest way to type a bunch of keys. The standard way is just a reference; alternatives are allowed. Barulheira correctly identifies what I was getting at - the prescribed way tells you to hit adjacent keys with the same finger, but I find it impracticable to press adjacent keys in sequence with the same finger. And this principle - the next key with the next finger - applies even stronger when the keys to be pressed in sequence lie further apart. On the other hand, when I press the same key multiple times, of course I use the same finger. The reason you use the natural (ahem, "prescribed" ) way is because otherwise you have no idea where your fingers are. That is, it's the F and J keys from which everything logically derives. This is the common point in all experienced typing, I'd say. Naturally you have to know where your fingers are, because your expectations of what is getting pressed (without looking at the keyboard - a mark of skill) must match with what actually gets pressed. The start position is the same, index fingers on F and J, and typing means reaching for all other keys around F and J. But then there's the fact that fingers are of unequal length and this is why I cannot imagine putting middle fingers on D and K, next to F and J. When index fingers are on F and J, middle fingers seem most at rest on R and I instead. Further, when I move a finger to a next position, all other fingers, the whole hand moves along with it, so the most convenient keys for fingers change with each change of position. My typing thus consists of inventive gestures throughout. It must be due to lack of dexterity (not dexterity that you previously accused me of) that I am unable to move each finger with precision confined to its own territory. This perhaps fits the description of a typist who never got beyond the clumsy beginner's stage. I mistype and have to backspace more than I'd like to. However, I don't have to search keys by looking at the keyboard. And my typing speed, including backspacing, is likely average, never too slow for actual work. And I'd say I started the right way once upon a time - I began to type on an actual typing machine 20 years ago, when I was unable to afford a computer. (More correctly, I didn't properly understand the difference between a typing machine and a computer besides the price.) On a typing machine there's no backspacing, and this is how I started, slowly and carefully considering each touch on keys. Having had some more conscious contact with different keyboards lately, there are some considerations I have been through. In addition to good computers and monitors, Dell makes good keyboards. This is a nice standard keyboard, Dell KB-212. Defender and Acme make more commonly available standard keyboards, closely resembling the above Dell, so much so that they look interchangeable, even though there are a few differences. Dell is more silent and has rubber feet on the other side to keep it solidly in place on the table. Defender and Acme are loud and gliding. Many keyboards come with more keys than the standard set. I personally need multimedia keys to set a media player to play/pause and to pick next/previous track even when the media player is not in focus. These have to be separate single-touch keys. Comboing multimedia functions via Fn key or configuring them in the window manager is a worse option in an extended high-speed productive situation. Such dedicated multimedia keys are very conveniently placed on this Defender Bern. The round button is meant to screw the volume up and down. It makes perfect sense for a volume button. The only problem with this keyboard is that it's a Defender - noisy and slippery, sometimes said to be of poor manufacture quality. Some kids may want to have a gaming keyboard. 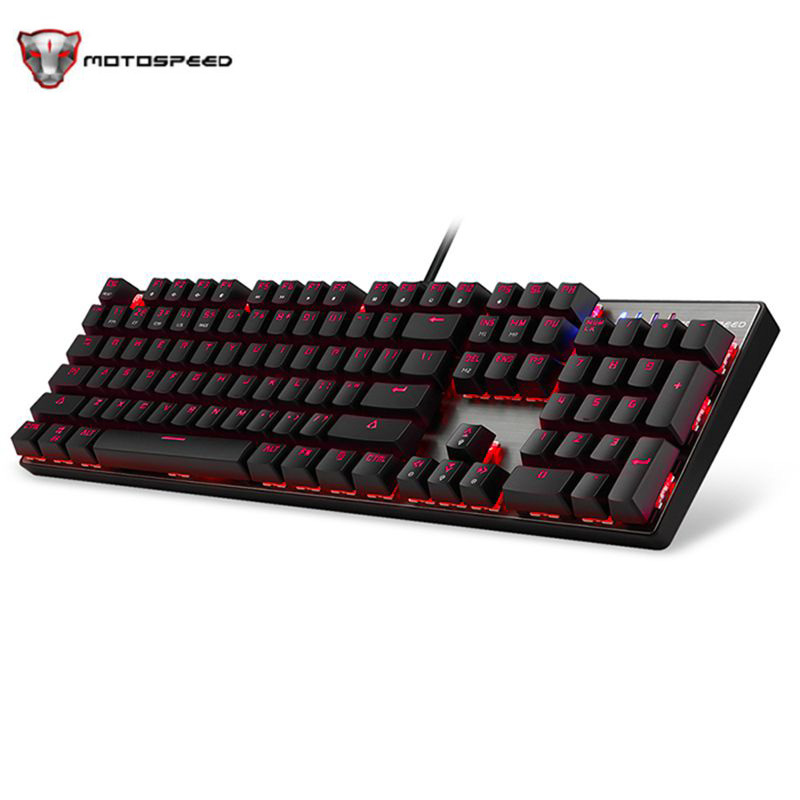 A true gaming keyboard is of durable manufacture, de/reconstructible, with programmable keys and endless lighting options. And they cost at least a $100. A cheaper option is a poor copy, nothing like that in the video above. This Tracer Kicker, a regular multimedia keyboard, may dupe a beginner gaming enthusiast one single time. 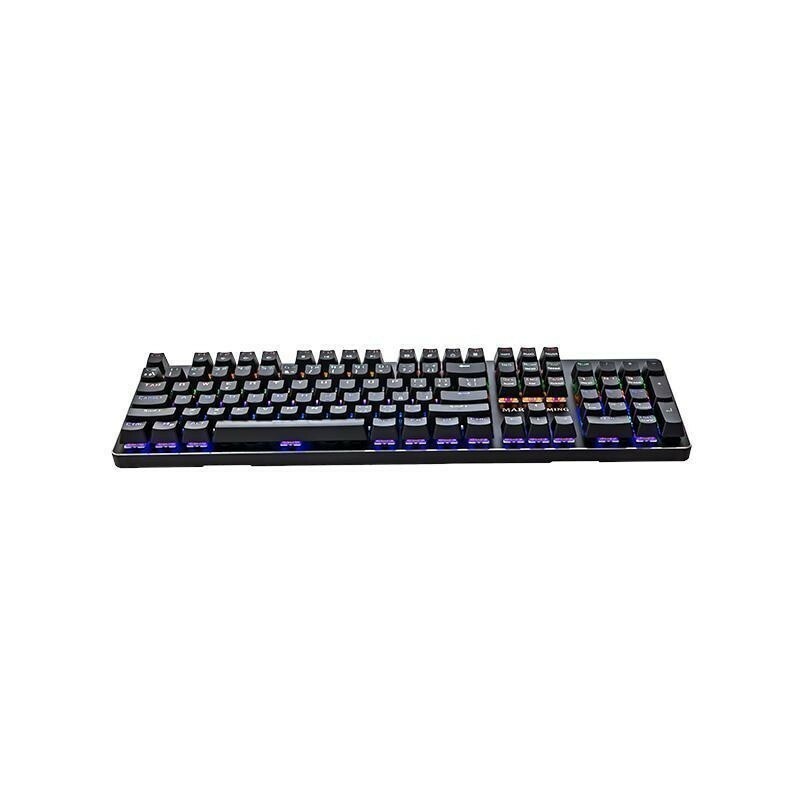 An affordable middle path among the different keyboard types may be provided by Zalman K300M. For people working long hours at keyboard, a handrest may be important. I like how this Modecom 9005 places the multimedia keys accessible for thumbs rather than any other fingers. But I would like the middle set of keys (Home, End, Page Up, Page Down, etc.) to be in three columns a la standard, when I look for a main keyboard. Currently I don't know of a better option than Dell KB-522 with detachable handrest. i use any keyboard , as long it works . for now i use wireless keyboard and wireless mouse . nothing special , it is just works as intended . My version of Tom Waits to explain my typing errors... blessed spell checkers. Dang. A key of a (very cheap, but backlit) keyboard at one of my main workstations got stuck. I thought I'm competent enough to open the keyboard and fix the little problem, but when I opened it, I accidentally broke a flimsy wire therein and now the keyboard is throwaway material. Guess it's high time to buy my first mechanical keyboard. I don't know if any true competitors have appeared since, but my wife's Motospeed Inflictor CK104 is still an excellent choice. The current model Das is probably no worse than mine, but it's up to something like €150 now. There are also new buckling springs, see here. I have an original Dutch Model M from '92 or so (was in use up to the late '90s at my parents' office; you wouldn't know it, excellent durability and build quality) but I personally think buckling springs are overrated. I mean, they're not bad or anything, and certainly superior to rubber domes... I just prefer your regular Cherry-style switches. Most competitors in the same price range as the Motospeed Inflictor CK104 speak of nonsense like "mechanical feel." There are some that might be slightly cheaper to be found on DX/GearBest/AliExpress that also look legit, particularly the "Metoo" brand. Also the Das Keyboard Division Zero X40 seems to be on sale for €25 on GetDigital.de at the moment. I haven't researched the build quality or the switches and I don't know what shipping to Estonia would be, but given that Das is still (to my knowledge) a respectable brand it certainly sounds interesting. https://www.reddit.com/r/MechanicalKeyboards/ can be useful for information but it's full of people who think something like this makes for a good keyboard. I think tenkeyless can potentially make a lot of sense (particularly if you have a separate, freely positionable numpad) but hiding a lot of functionality behind modifier keys just puts more stress on your hands. And yes, I noticed the eery "mechanical feel" detail on some offers too. I ordered Tacens MK-4, available in Estonia in a snap, some pennies above €40. We'll see how bad it is. If Tacens is too atrocious, I will change to the equal-priced Modecom Hammer, available at the same shop. I think my wife got hers from Gearbest. But yes, that's probably no faster. I'm operating on the assumption that everyone has a few spare rubber domes lying around, I suppose. The Modecom looks interesting. Couldn't really find much info on the Tacens. I'm operating on the assumption that everyone has a few spare rubber domes lying around, I suppose. Couldn't really find much info on the Tacens. I would better like the idea of having a selection of uniform colours (like Motospeed Inflictor CK104 has) but maybe I will find the distinctly coloured keylines practical. We'll see. The biggest issue is how loud it will be. My spare Dell KB-522 is a good baseline. Surely you know how to look stuff up on YT. Fine, fine, I couldn't quickly find much in a format that doesn't require watching a video. The biggest issue is how loud it will be. My spare Dell KB-522 is a good baseline. Depends on the switches. "Blues" (real and imitations) are not quiet. I don't find them bothersome, although I use browns myself. All of the variants are available at my closest shop too, so I can choose. I'd probably go for browns, because I like it that it says "quiet" (I really like how quiet my Dell KB-522 is). But the MK-4 I already ordered is supposed to have reds. Edit: And I found out that all of them (Inflictor, Hammer and MK-4) use so-called Outemu switches. So, not Cherry MX switches. Maybe in a decade or so I will know what the difference is. The biggest issue is how loud it will be. Actually my biggest worry was whether it would lit up at all under Linux. My former keyboard who died had to be lit up by xset led 3 and this was the only way and the only setting it recognised. Now I can declare that MK4 has all the power and magic of lighting programmed in itself. It can display all the variant lights just by virtue of having electricity and requires no special commands from Linux. The mechanics of the keys still need some time of getting used to. Red switches register easily, whereas I am used to pressing the keys all the way to the bottom, and these keys have a rather long ride to the bottom. 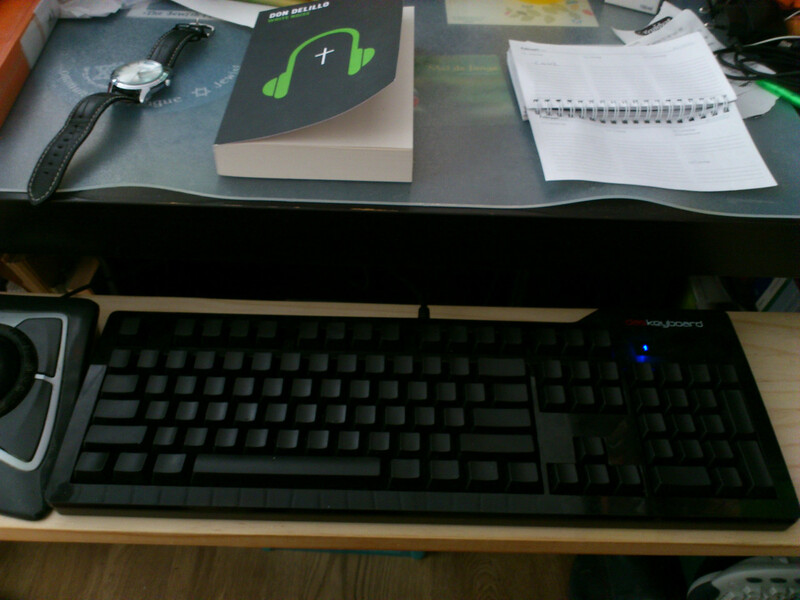 And the keyboard seems to have a considerably greater height from the table surface. Now I've tried a mechanical keyboard with red switches (linear non-click) and another with brown switches (tactile non-click) and my verdict is: What a bunch of overhyped nonsense. Both of them. The verdict applies when you are not a snobby expert typist. I'm sure snobby expert typists can see and make use of the value in some of those keyboards, but given my own particular conditions I can only see that there could be some limited use, but there's hardly a chance to make full use of it. For example, I have several workdesks. If I want the same typing experience on them all, I have to buy the same gear for them all. Not really feasible. It could be considered practically useful that mechanical keyboards may have better manufacturing quality overall. This applies to my MK4 (red switches) and I have decided to keep it - just for the excellent manufacturing quality, not for the typing experience. I also tried Modecom Hammer (brown switches) and, while undeniably a mechanical keyboard, it was as if intentionally made to reduce the experience to "membrane feel". The tactile feedback was there in the brown switches, but it was mushy and provided no detectable advantage over some of the membrane keyboards I have. And Modecom Hammer is noticeably worse in manufacturing compared to MK4. Both keyboards are loud as hell when you are not used to type lightly. And even when you are typing with utmost care to the precise register point, there's much collateral noise. If you want silence, make your pick among membrane keyboards. Worst of all, the so-called mechanical keyboards do not provide a truly mechanical typing experience. The experience certainly does not emulate a full-mechanical typewriter (and it's good this way, because Remington & friends are horrible). I still have my electronic typewriter (Brother AX-310) and its keyboard is far more pleasant than these so-called mechanical ones. The tactile feedback on the typewriter is a true metal feedback as opposed to the constructed plastic mushiness of the brown Outemu switches on Modecom Hammer. And MK4's easy-sliding red switches are a different universe. The intros to mechanical keyboards talk long about the linear versus tactile switches as if it were some essential parameter. It may be important, but to me it seems that resistance weight (measured in grams) is considerably more important. Broadly, the harder the better for a typist. Naturally I largely disagree with you. The problem with your average rubber domes is not necessarily the general feeling of pressing a key, but that you have to pound down to make sure your keypress is actually registered. As far as the comparison to mechanical typewriters goes, that's not unlike a mechanical typewriter. Yet perhaps ironically, pounding down on a rubber dome wears it down even quicker, while a mechanical keyboard can take a lot of abuse. Part of a slightly bigger loudness when bottoming out comes from the sturdy steel plate that's also responsible for most of the weight. The intros to mechanical keyboards talk long about the linear versus tactile switches as if it were some essential parameter. Tactile switches give you better feedback as to when the key was activated precisely so you don't have to pound them down all the way. It's basically a soft bottom to your press. Linear switches are basically exactly the same in feeling as a decent rubber dome except they barely wear down and keypresses will register more reliably since not bottoming out hard enough is not a cause of failure. The distinction is definitely important. Worst of all, the so-called mechanical keyboards do not provide a truly mechanical typing experience. Buckling springs feel more typewriter-like. I'm not the biggest fan but I still wouldn't part with mine for less than a few hundred. You should be able to get a reasonable used model for about €60 and they've recently started manufacturing new models again. Depending on your perspective you could say they come with annoying Windows and context menu keys that mine predates by half a decade or you could say they come with all of the requisite modern amenities. Presumably a high-quality rubber dome. See p. 26 of this document. Both keyboards are loud as hell when you are not used to type lightly. That is the key though. With a rubber dome you're forced to pound down, which makes the overall typing experience comparatively worse. And indeed, I don't get the full experience out of my keyboard by a long shot. Every time after using another keyboard (e.g., on my laptop) I'm back to typing too heavily again for at least a little while. I'm not really sure about your point regarding the same experience though. Rubber domes differ greatly in quality among themselves as well. Well, the rubber-dome keyboards I have, they are quite nice on average. You definitely don't have to pound any of them. I can't imagine why would you even think of pounding the low-profile ones, but the high-profile ones don't require any pounding either. All they require is pushing (as opposed to pouding) the key all the way down, which sort of effortlessly happens by itself, at least given the way I type. The issue with mechanical keyboards is that when pressed they same way all the way down, they clack loud as hell, and even when you touch them lightly, they are apparently irreversibly noisy. The noise is somewhat an issue for me. Dell KB-522 is a good baseline for a silent keyboard, even when you pound it (which you don't have to do). I have watched some YT videos about them. The rings only make you think they dampen the noise. And they are very much producer-specific - one type of rings for Cherry MX's, another for Outemus. And not available across the street = not worth it. Which is why it was good that I could compare the aluminum-built MK4 with all-plastic Hammer. Both are equally noisy, maybe MK4 a bit more, but I like the sound of metal better. I agree that the difference sounds important and in theory the idea is very good. But I did not find it workable in practice. Both the reds and the browns are touchy-sensitive, they react way too lightly, so the "feedback" makes no practical difference. I realised that with some practice I would be able to learn to push just 2-3 mm even on the reds. Regardless of the feedback, I can learn to not press the keys to the bottom, but to travel lightly on top of them. And here's a key point: To travel lightly on top of the keyboard is not what people do with typewriters, mechanical or electronic. These new mechanical keyboards are an entirely new product. There's nothing really mechanical about them, but they are marketed as if taking you back to the age before membranes and rubber-domes. False marketing. Anyway, for me it's somewhat interesting to learn to type this way and I am willing to give it a try. But I know there are more switches than just reds and browns. For example blacks are said to be heavier. They may alter the overall picture. I have not tried heavier ones yet, but for now from my perspective it seems that heaviness is a more important parameter then tactility/linearity. Buckling springs feel more typewriter-like. I'm not the biggest fan but I still wouldn't part with mine for less than a few hundred. You should be able to get a reasonable used model for about €60 and they've recently started manufacturing new models again. Maybe some day I will give one of those a try too. The problem with them all is that they are not easily found and I am not a typist of the sort who should be heavily invested in this. My work involves much more mousing (copy-paste and drag&drop) than typing, so I spend much of my time with the trackball (there's one on every workdesk). And the trackballs have their own buttons. It's actually awkward to switch between the mechanical keyboard and the trackball. From my perspective, the ideal keyboard would in fact have the same type of keys as the buttons on the trackball. All they require is pushing (as opposed to pouding) the key all the way down, which sort of effortlessly happens by itself, at least given the way I type. That's simply the process I mean by pounding. Having to press it down all the way to the bottom really gets in the way of speedy, comfortable typing. Just like how it gets in the way of speedy writing on a typewriter. On a real typewriter I have to be careful not to jam it. Obviously I lack experience to a degree but I doubt it's realistically possible to go much beyond ~200 cpm. On my electronic typewriter I can type a whole A4 in less than a fifth of the time it takes the typewriter to type it. I'm surprised it has a memory large enough to buffer the rest of the page, but it does. I'm limited by its typing speed, not by my own. On an average rubber dome I can type either accurate or fast, which is almost more annoying than jamming. One a mechanical keyboard I can just type. The mechanics don't get in the way. You should be able to tell right here on the forum if I typed on my laptop or my desktop. Missing keystrokes strongly hint toward my laptop. And not available across the street = not worth it. They are available across the street, but for €15. To travel lightly on top of the keyboard is not what people do with typewriters, mechanical or electronic. Of course not. These are computer keyboards. They're much, much, much better than a typewriter, no matter how amazing my dad's completely mechanical Brother typewriter (not electronic) might be. Buckling springs were developed for people who like typewriters. I'm a member of a younger generation that says f*ck this typewriter imitation, why would I want that. I want light, elegant typing. Many people do, hence the popularity of chiclets. They don't require pounding in any kind of absolute sense, but they do require pounding in the sense that you can feel like you're pressing them down yet they still don't register. Hence accuracy or speed. If you grew up on a mechanical typewriter, then perhaps pounding down properly feels as natural as can be, but you are almost certainly sacrificing comfort, speed, or both. but they are marketed as if taking you back to the age before membranes and rubber-domes. False marketing. It's not false marketing. This is how most computer keyboards used to be. My IBM Model M is one of the many millions manufactured of one the most common keyboards of the '80s and early '90s, before rubber domes became more common. Rubber domes have always existed, but they didn't take over until the mid-'90s if not later. But anyway, only buckling springs are marketed as taking you back to the era of buckling springs. Besides which, the same Cherry MX switches in my keyboard (and all the current Chinese clones) have been around since the mid-'80s as well. That makes them younger than rubber domes and buckling springs, but it might very well be true that they were most popular in the late '80s and early '90s. (And now from the mid 2010s.) So they can definitely be like the nostalgic keyboard from your youth if you're under 50. From my perspective, the ideal keyboard would in fact have the same type of keys as the buttons on the trackball. Funny, I've been thinking about doing the exact opposite: buying or soldering keyboard switches into mouse buttons. Also, and while this is not technically a problem with rubber domes per se, there's a large contingent of cheap rubber domes that ghost if you type too quickly. So it'll either register keys you didn't type or simply miss keystrokes that you did type. And I just realized my laptop keyboard suffers from ghosting. Which confounds and confuses the generic rubber dome trouble. There are just too many ways for those BEEPers to miss keystrokes. Since I never had any speed, I am not sacrificing it either. And I have my own ideas about comfort. For example I am able to doze over my membrane keyboard (hands first and then the head) so that none of the keys registers. Now that's comfort! I have not found a way to do the same on the MK4. And I just realized my laptop keyboard suffers from ghosting. This is to do with the electronics of the keyboard, not with the mechanics. There are anti-ghosting keyboards among membrane/rubber-dome ones. And my typewriter was apparently built to memorise the sequence pretty far down the line. Occasionally it happens that I type more than a line and then the printing on the paper follows without missing anything. I see you are saying basically the same.